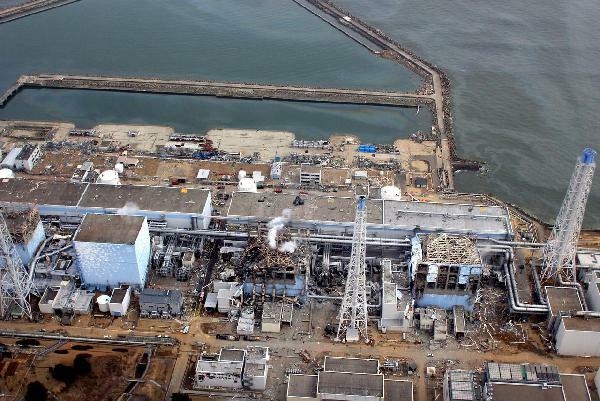 The Fukushima corium is the three melted down Fukushima, Japan nuclear reactor cores. The Fukushima corium removal technology does not exist. Not only does the Fukushima corium removal technology not exist, but the technology does not exist to even locate the Fukushima coriums. A fierce debate is raging today over two and a half years after the Friday March, 11, 2011 meltdown of three Fukushima nuclear reactors into corium. Some people think that the Fukushima coriums are still in the basement of the Fukushima nuclear reactors while other people think that the Fukushima coriums have melted through the nuclear reactors into the soil and the underground river underneath the reactors daily carrying tons of extremely radioactive water into the Earth’s one Ocean. Go look at your child’s globe. The nuclear reactor cores melted down at Fukushima nuclear reactors 1, 2 and 3. Humans cannot enter the buildings because the radiation poisoning will kill them instantly even with their Hazmat suits on. Robots cannot go look for the Fukushima coriums because the intense heat and radiation destroys them. Humans cannot find or remove the Fukushima coriums. Robots cannot find or remove the Fukushima coriums. The technology does not exist to find or remove the Fukushima coriums. So what is Japan doing? Well, the Fukushima nuclear reactors are on the shore of the Earth’s only ocean, at the bottom of a hill. Water flows down the hill every day since the meltdown approximately 970 days ago right through the reactors and out to Sea. In addition Japan is pouring tons of water every day onto the three melted down Fukushima nuclear reactors to keep the Fukushima coriums from exploding again and wiping out Japan and then the rest of the world with 2,000 deadly poisonous forever lasting radioactive poisons according to famed scientist David Suzuki. This process will continue forever poisoning the Earth’s one ocean or until the technology is invented to find and remove the Fukushima coriums. Sixteen nuclear reactors are on the shores of the Great Lakes, 25% of the world’s fresh water. These nuclear reactors all over the world are susceptible to terrorist attacks and natural earthquakes. The deadly radioactive plume from Fukushima has already reached the west coast of North America from Alaska to Mexico. The Fukushima world cancer has already metastasized across the Pacific Ocean. Naming different Oceans is like naming different parts of your bathtub. Ocean water evaporates and pours radioactive rain onto the land which then poisons the aquifers. John Boehner disdainfully refers to Obama’s EPA and the Republicans want to do away with the EPA, and all regulations on the nuclear industry. Republicans believe in unfettered capitalism which allows the owners of the nuclear reactors to accumulate all the money, media, judges and politicians. An income statement in our system is the revenues less the expenses. Somehow, the owners of the nuclear reactors are not responsible for the expenses of the cleanup or the damage caused by their nuclear reactors. King David wrote in the Psalms, “The wicked are without knowledge or understanding, they walk in darkness and fall into their own traps, the foundations of the Earth open up underneath them.” The now dying Ocean phytoplankton and the rainforests’ trees which are all nearly gone, supplied the Earth’s oxygen: try living without oxygen. The Republicans claim to be pro life. Ask them how can you be pro life when you support the construction of nuclear reactors for which no technology exists to find or remove the melted down coriums, which are now in the process of murdering all life on Earth forever, including every Republican man, woman and child? Japan’s new answer to this question is to imprison any person who talks about it, publishes or tweets about it for 10 years, if life on Earth is still here in 10 years.